Chinese bike-sharing company Beijing Mobike Technology Co. Ltd. is set to launch its service in Israel in the first quarter of 2018. The launch was announced on Thursday by Israeli car rental company Car2Go Ltd., which partnered with Mobike to bring the service to Israel. The Israeli service will be operated by a local subsidiary, Mobike Israel, Car2Go said in a statement. Mobike Israel will initially operate several hundred bikes, with plans to run thousands of bikes nationwide by the end of the year, Car2Go said. Mobike has already begun shipping its bikes to Israel and has been negotiating operation agreements with several municipalities in Israel, Car2Go said, adding that as part of their partnership, Car2Go will loan Mobike $200,000 in return to a 51% stake in the Israeli joint venture. Founded in 2015, Mobike is a cashless and station-free bike sharing service operated via a smartphone app. Unlike other bike sharing services, Mobike users can pick up and drop off their bike anywhere and are not required to dock the bike at a designated parking station. 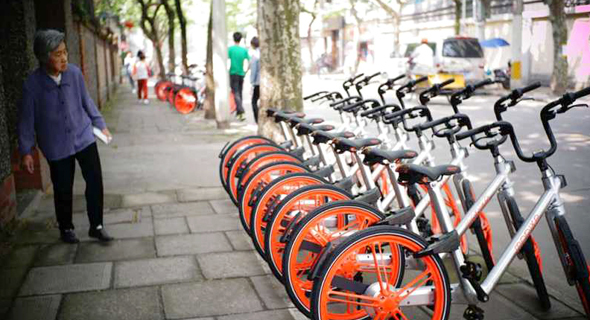 Mobike does not charge a membership or sign-up fees, charging instead only for the time the bikes are in use. Mobike has tens of millions of users in China alone, where it operates in more than 160 cities. In 2017, the company began operating outside of China, in countries such as Singapore, Japan, Malaysia, Italy, The Netherlands, Australia, and the U.S. Mobike has raised nearly $1 billion in investments in 2017 and is backed by Tencent Holdings Limited. Mobike is the second Chinese bike-sharing company to enter Israel, following Ofo, which launched its Israeli pilot in October. Known for its yellow bicycles, Beijing-based Ofo first offered its services in Israel on the campus of Bar-Ilan University, located in the greater Tel-Aviv area. Founded in 2014, Ofo operates over 10 million bikes in more than 200 cities, with 200 million global users. China’s largest bike-sharing service, Ofo reports around 20 million rides per day in China alone. In July, Ofo received $700 million in a funding round led by Chinese ecommerce company Alibaba Group Holding Ltd.
Like Mobike, Ofo’s operational model also does not include docking stations, instead, allowing users to unlock bikes by entering a code into an app on their phones. In October, Bloomberg reported that Mobike and Ofo are negotiating a merger. If merged, the combined valuation of China’s two biggest bike-sharing startups would likely exceed $4 billion.